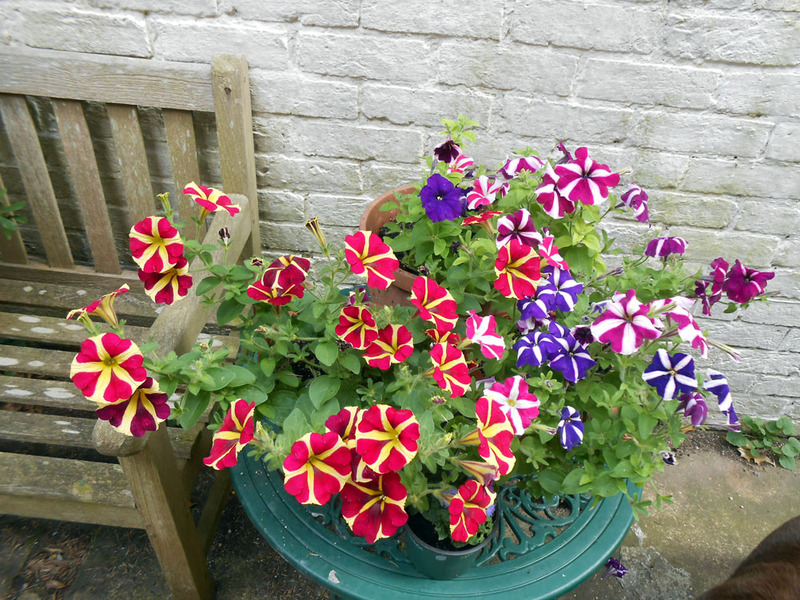 I used to grow Petunias religiously. Loved the various colors. Now, it’s all about things we can eat, but I do miss the colors. Thanks for sharing yours with me. Petunias are from the nightshade family and not for eating, but there are a lot of flowers that can be eaten. Nasturtiums are yummy and peppery. I know that they sell them in salad packs in posh supermarkets and delis in the UK for quite a price, so that might be something you could grow and sell at farmers’ markets. They look like some kind of strange humbug, vibrant and cheery. They do look like humbugs, don’t they? I used to love those huge glass jars in sweet shops that were filled with assorted humbugs. I had to look up humbug! And yes, they do look like them! Pretty and deliciously colourful! They are wonderful, and seem to go on forever. So far, it’s been two months of continuous flowering, with many more blooms on the way 🙂 I buy them every year, although this is the first time I’ve found any yellow-striped maroon ones!